When I went to the Crumbs bakery to buy goodies for election parties I’m going to tonight, I found that New Yorkers have voted. 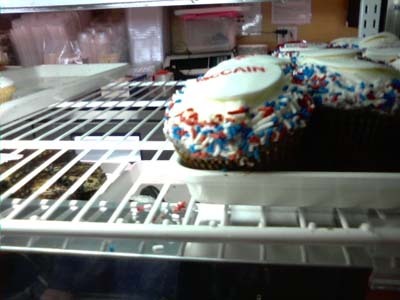 The Obama cupcakes were sold out when I bought the last two Obama Rocks cupcakes at 1:30 p.m.
None of the McCain cupcakes had been sold. The shop began to cover McCain’s name with Obama’s, to the cheers of the people waiting in line. If you haven’t already voted for real, please get to the polls right now! These look incredible! I hope you enjoyed your night. It’s so great to see New Yorkers passionate about a cause. Thanks for posting this!